Al is a client-friend that has chartered me since the beginning of my service. For about 5 years he fished with me every Saturday of the year with the exceptions of foul weather. Living in Belize he does not come to VA. often but he scheduled a trip a month ago and flew up to see what the lake was like now. We hit the water around 9am yesterday and took an hour to catch bait then went fishing. We had already missed the morning bite so fishing was slow but we managed a nice limit. Slow fishing allowed plenty of time to catch up and BS about the many hundreds of fishing trips we experienced together. For old time sake I bitched at him a little just to get a reaction out of him. Good day on the lake. Here is Tony holding up a Striper DJ caught in the morning which was too big for DJ to hold by himself. 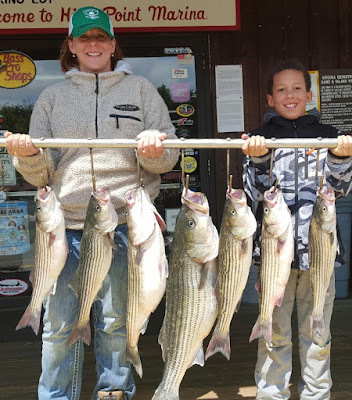 This is Janet and her grandson DJ holding up a stringer of Stripers. They fished early morning and came off the water early catching plenty of keeper Stripers but only keeping a few. 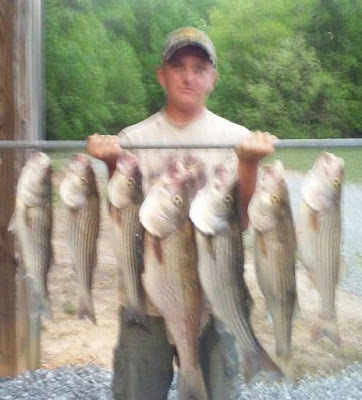 Don took Bubba out yesterday afternoon and caught some nice fish. Don needs to clean the bait slime off of his camera lens on his phone so we can see the fish better. The lake is in transition now and very soon we will enter into a summer pattern of 50 to hundreds of fish a morning. 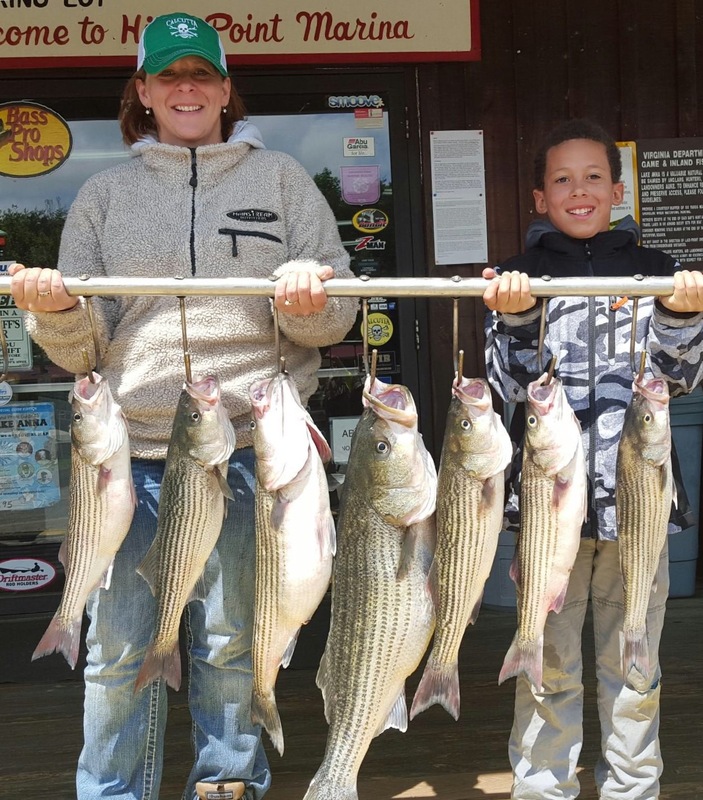 Better book your trips soon to avoid getting shut out of this great Striper fishery. 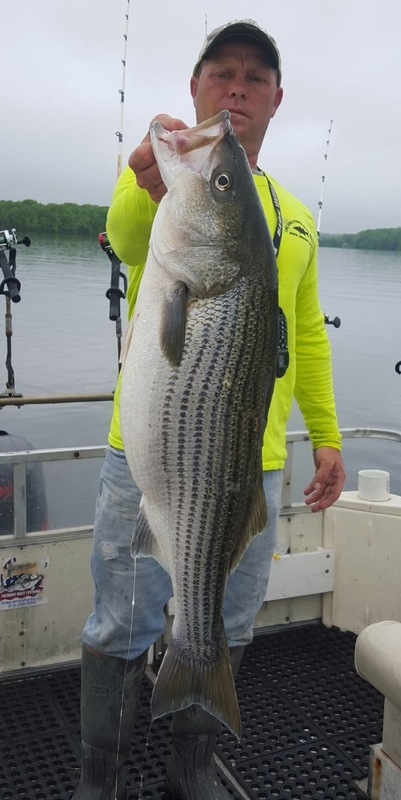 Limits are the best in Va., 4 fish per person per day over 20 inches. Come on down and get you some!